Perhaps I’m a bit juvenile, but as an English speaker, certain German words give me pause. They just don’t mean what I think they should. Fahrt – As a traveler, I see this word frequently. I’m particularly entertained by signs that say Gute (Good) Fahrt or Über Fahrt. But the word does not mean what I think it does. 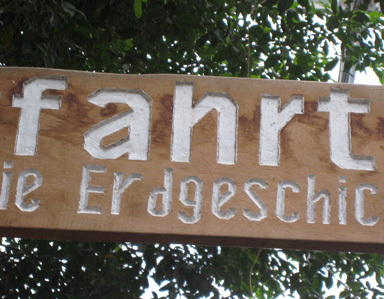 Fahrt is German for ride, trip, or path. Often, it’s part of a bigger word, such as Ausfahrt, which you’ll see if you drive on the Autobahn…it refers to an exit ramp. (Alas…I think I’ll always get a kick out of Gute Fahrt). Hell – If your mother-in-law walks into your house and says, “It’s hell in here,” don’t worry, she might not be insulting you. Hell is the German word for bright or light (Of course, if she doesn’t know that…). Schmuck – You will often see this word on store windows. It doesn’t mean the shop is peddling your old boyfriends. Schmuck is the German word for jewelry. (Perhaps if your old boyfriend had given you Schmuck, you wouldn’t think of him this way). Rathaus – This word is German for Town Hall. It’s a house where politicians hang out. I think this word is particularly appropriate now that election time is upon us once again.